Then there was Maye, who set an NFL record on the game’s final play. Maye intercepted a pass in the end zone by Denver quarterback Case Keenum and returned it 104 yards before he was caught at the 1-yard line. 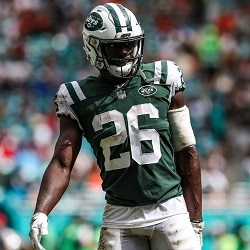 According to the Elias stat service, Maye’s 104-yard adventure was the longest non-touchdown interception return in league history. In addition to the historic pick, Maye had eight tackles and half-a-sack. After an impressive (and surprising) season-opening blowout victory on the road against the Detroit Lions, the Jets went on a three-game losing streak. That included a loss in Cleveland on Sept. 20 that made the Jets the first team to lose to the Browns since 2016. The Browns went 0-16 last season. With the win on Sunday, the Jets snapped their skid and had their best defensive performance of the season so far. Scottie Young Jr., S, Arizona (NCAA) — Playing the “Spur” position in the Wildcats’ defense, Young had seven tackles and two interceptions in Arizona’s 24-17 win over California. Young took one of his picks back 24 yards for a score. Devin McCourty, FS, Patriots (NFL) — After some struggles and inconsistency the first four weeks of the season, New England looked like they were officially “back” on Thursday in a 38-24 win over the Colts that wasn’t even as close as the score indicates. The story of the night was Tom Brady, who threw his 500th career touchdown pass, but the star of the Pats’ defense was McCourty. He had 14 tackles and a fumble recovery which he collected after forcing the fumble himself. Brandon Jones, S, Texas (NCAA) — There wasn’t a lot of defense being played in this year’s edition of the Red River Shootout, as the Longhorns upset rival Oklahoma 48-45, but Jones stood out with nine tackles and an interception that set up a Texas field goal in the first quarter. Denzel Ward, CB, Browns (NFL) — The rookie had five tackles, an interception, two pass breakups and he blocked a field goal, which was crucial in Cleveland’s 12-9 overtime win against the Ravens. Julian Love, CB, Notre Dame (NCAA) — The junior corner had seven tackles, an interception, and a fumble recovery that he returned 42 yards for a score in the Irish’s 45-23 win over Virginia Tech on Saturday. 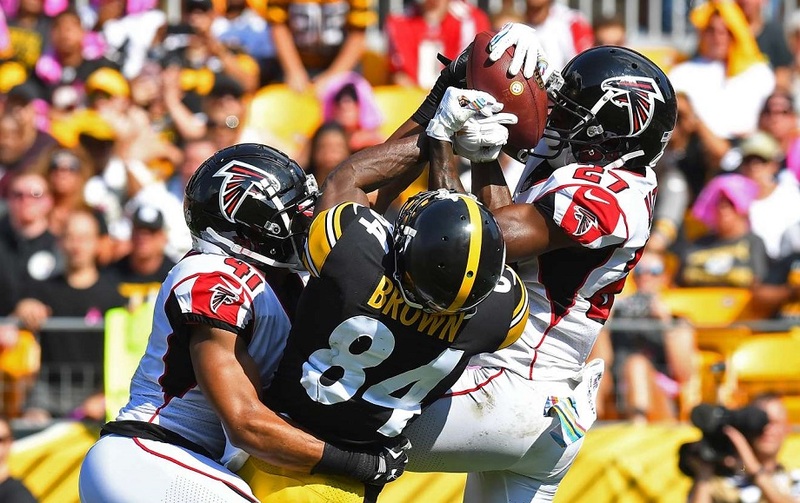 Pic of the Week: Atlanta Falcons safety Damontae Kazee, right, intercepts a pass intended for Pittsburgh Steelers receiver Antonio Brown on Sunday. The Steelers won 41-17.